This month's Kickstarter update is upon us (slightly earlier than usual, with a day still to go before the end of the month!). 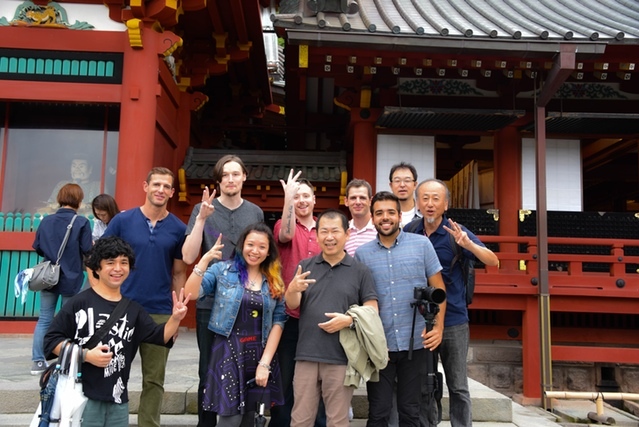 The update consists of photos from the day the $10,000 Kickstarter backers and their guests spent with Yu Suzuki on September 16 for their Dinner in Japan reward, which we had a glimpse of earlier in the month. Here is a small selection of photos from the full set, and a few comments. Photo 1: In Kamakura, where they wandered along Komachi-dori, a bustling shopping alley near Kamakura station. 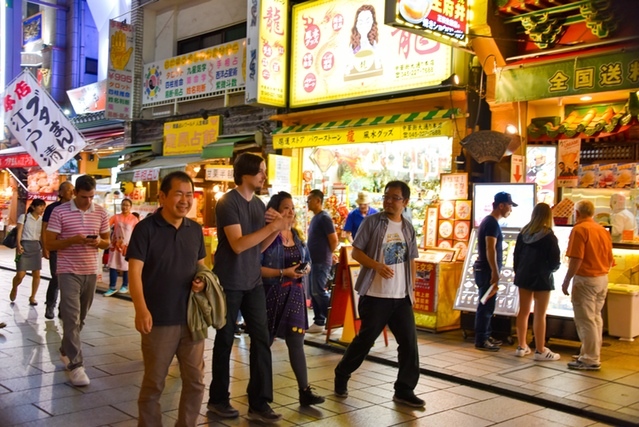 It is a popular destination for both Japanese and overseas visitors, with shops of all kinds selling souvenirs and snacks. There are even shops that specialize in cooking fresh rice crackers while you wait, dipping them in soy sauce and handing them over wrapped in a piece of paper. Delicious! 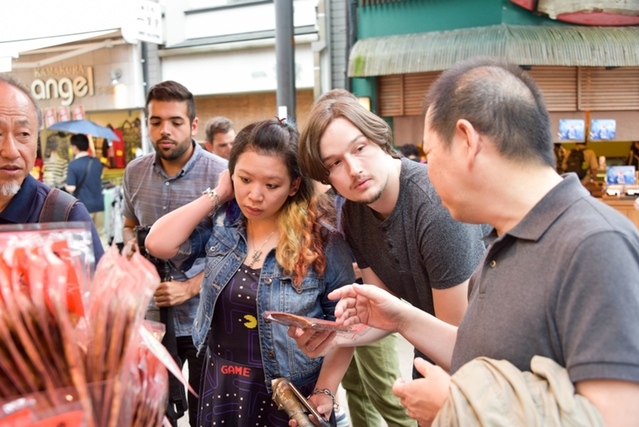 Inspecting individually-wrapped rice crackers on Komachi-dori. Photo 2: Komachi-dori shopping street leads towards Tsurugaoka Hachimangu, which is the most important shrine in Kamakura. The main shrine is set on the side of a hill, with a steep staircase to ascend. At Hachimangu shrine: outside the main building, at the top of the grand stairway. The city of Kamakura is also home to Kotoku-in temple, which has the Great Buddha statue in its grounds that was also visited by the group. Photo 3: The next destination, Yokohama Chinatown, is located around a 40 minute drive from Kamakura. 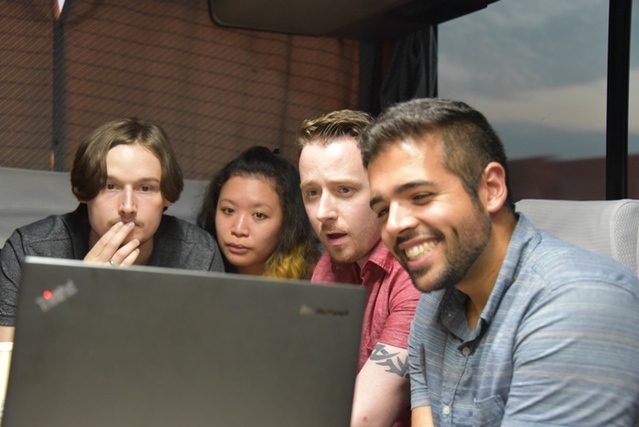 During the ride on the private bus, the backers are treated to a special preview of Shenmue III development progress. The expressions on the faces in this photo says it all for me. This photo promises good things to come! 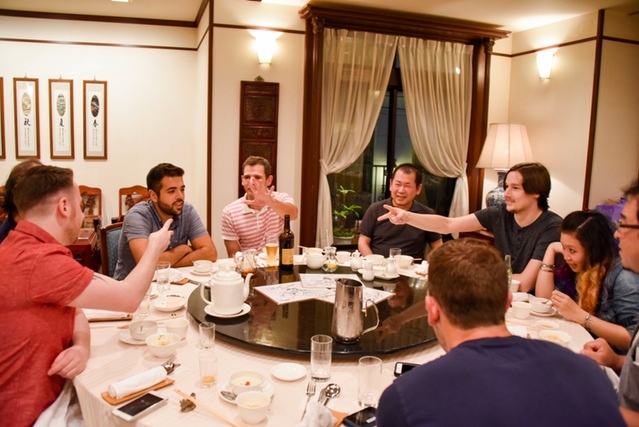 On the Shenmue Dojo forums one of the dinner backers, Peter, hinted that fans have good reason to "look forward to the future". Exciting stuff indeed. In fact, I was fortunate to be able to meet up with Peter and another of the backers while they were over here in Japan. Something interesting Peter mentioned is that Yu's English ability is much better than one might be led to believe just from his interview videos where he generally uses an interpreter. (He did give himself away during one of the recent interviews at MAGIC Monaco, when he stepped in to make a small correction to the interpreter's English translation!). Photo 4: Chinatown in Yokohama. Yu looks relaxed and smiling, and really seems to be enjoying the time spent with the backers. Heading towards the restaurant for the main event. 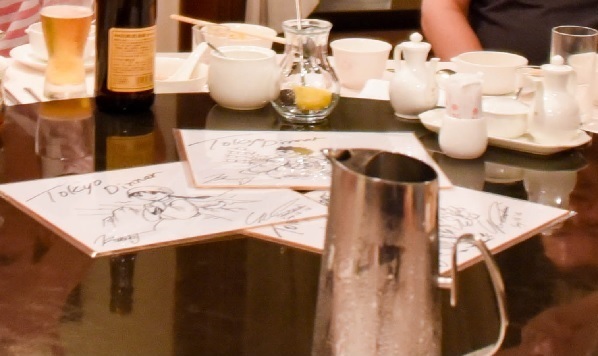 Three signed illustrations, labelled "Tokyo Dinner"! It can be seen that the first is of Shenhua, and it looks like Ryo in the second. The third remains a mystery for now as it is hidden behind a strategically-placed jug. A reasonable guess would be that these art pieces are part of the reward package for the backers, and that the Rock-Paper-Scissors game was to assign each piece to a backer in a fair manner. Kickstarter Update #60: link to official site. This month's update predictably was focused on the Kickstarter Dinner, being the main event of the month, and it was great to see some new photos of the day. Thanks to these top-tier backers, the Shenmue Kickstarter fundraising had a huge boost and I sincerely hope the event was everything they had hoped it would be. It would have been a nice bonus to also have had an update on the development progress on Shenmue III, but it looks like we will need to wait for next month. In any case, judging from some of the hints in comments from the backers, and the photos themselves, we should be in for some exciting updates and revelations in the future!